The association between common benign gynecologic conditions and ovarian cancer remains under-studied in African Americans. Therefore, we examine the association between self-reported history of benign gynecologic conditions and epithelial ovarian cancer risk in African-American women. 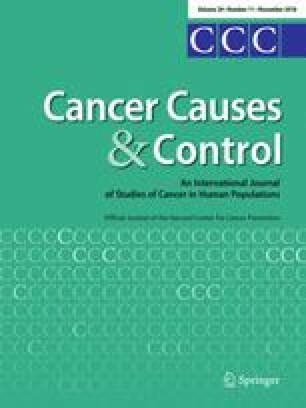 Data from a large population-based, multi-center case–control study of epithelial ovarian cancer in African-American women were analyzed to estimate the association between self-reported history of endometriosis, pelvic inflammatory disease (PID), fibroid, and ovarian cyst with epithelial ovarian cancer. Logistic regression was used to calculate odds ratios (OR) and 95% confidence intervals (CI) for the associations between individual and composite gynecologic conditions and ovarian cancer. 600 cases and 752 controls enrolled in the African American Cancer Epidemiology Study between 1 December 2010 and 31 December 2015 comprised the study population. After adjusting for potential confounders, a history of endometriosis was associated with ovarian cancer (OR 1.78; 95% CI 1.09–2.90). A non-significant association of similar magnitude was observed with PID (OR 1.33; 95% CI 0.82–2.16), while no association was observed in women with a history of fibroid or ovarian cyst. A positive trend was observed for an increasing number of reported gynecologic conditions (p = 0.006) with consistency across histologic subtypes and among both oral contraceptive users and non-users. A self-reported history of endometriosis among African-American women was associated with increased risk of ovarian cancer. Having multiple benign gynecologic conditions also increased ovarian cancer risk. The online version of this article ( https://doi.org/10.1007/s10552-018-1082-4) contains supplementary material, which is available to authorized users. We would like to acknowledge the AACES interviewers, Christine Bard, LaTonda Briggs, Whitney Franz (North Carolina) and Robin Gold (Detroit). We also acknowledge the individuals responsible for facilitating case ascertainment across the ten sites including: Jennifer Burczyk-Brown (Alabama); Rana Bayakly, Vicki Bennett and Judy Andrews (Georgia); the Louisiana Tumor Registry; Lisa Paddock and Manisha Narang (New Jersey); Diana Slone, Yingli Wolinsky, Steven Waggoner, Anne Heugel, Nancy Fusco, Kelly Ferguson, Peter Rose, Deb Strater, Taryn Ferber, Donna White, Lynn Borzi, Eric Jenison, Nairmeen Haller, Debbie Thomas, Vivian von Gruenigen, Michele McCarroll, Joyce Neading, John Geisler, Stephanie Smiddy, David Cohn, Michele Vaughan, Luis Vaccarello, Elayna Freese, James Pavelka, Pam Plummer, William Nahhas, Ellen Cato, John Moroney, Mark Wysong, Tonia Combs, Marci Bowling, Brandon Fletcher, (Ohio); Susan Bolick, Donna Acosta, Catherine Flanagan (South Carolina); Martin Whiteside (Tennessee) and Georgina Armstrong and the Texas Registry, Cancer Epidemiology and Surveillance Branch, Department of State Health Services. JS, HP, and MC contributed to the conception and design of the study, analysis and interpretation of data, and drafting of the manuscript. JS, AA, JBS, EF, PT, JJR, and AS contributed to the interpretation of the data and critical revision of the manuscript. All authors reviewed and gave approval of the final version to be published. This study was supported by the National Cancer Institute (R01CA142081). Additional support was provided by the Metropolitan Detroit Cancer Surveillance System with funding from the National Cancer Institute, National Institute of Health, and the Department of Health and Human Services (Contract HHSN261201000028C), and the Epidemiology Research Core, supported in part by the National Cancer Institute (P30CA22453) to the Karmanos Cancer Institute, Wayne State University School of Medicine. The New Jersey State Cancer Registry, Cancer Epidemiology Services, New Jersey Department of Health, is funded by the Surveillance, Epidemiology and End Results (SEER) Program of the National Cancer Institute under contract HHSN261201300021I, the National Program of Cancer Registries (NPCR), Centers for Disease Control and Prevention under grant 5U58DP003931-02 as well as the State of New Jersey and the Rutgers Cancer Institute of New Jersey. The study protocol and questionnaire were approved by the Institutional Review Boards at Duke University Medical Center, Baylor College of Medicine, Case Western Reserve University School of Medicine, Louisiana State University, Robert Wood Johnson Medical School/Rutgers Cancer Institute, Wayne State University, the University of Alabama-Birmingham, the Medical University of South Carolina, and the University of Tennessee-Knoxville. Additionally, the protocol was approved by central cancer registries in the states of Alabama, Georgia, North Carolina, South Carolina, Tennessee, and Texas, SEER registries in New Jersey, Louisiana, and the Detroit metropolitan area, and 9 individual hospital systems in Ohio. All study participants completed informed consent prior to enrollment. The dataset used and analyzed in this study is available after review from the AACES study investigators and with proper IRB approvals.